Amazingly everything went without a hitch on Saturday. We had a nice little group of 7 or 8. Chip Phillips was there and a couple of representatives from Boulder OSMP. Right on cue the golden eagles flew overhead as we discovered an old carpet square someone left behind so environmental lessons were abundantly available. By noon we had made it down to Beer Barrel rock, so we made it only about half way but I will plan on part 2 in the next month or so. Scott Rennak and I discussed the work being done by the Flatirons Climbing Council as well as the OSMP CCG which could have a huge impact on access to climbing resources in the area. The short version is that climbers in the Boulder area are finally mobilizing towards responsible stewardship and community activism to make sure that climbing areas are both protected and accessible. Bouldering should be better represented in that effort. Afterwards I did a little bouldering, getting very close on the low start to That Flakes It Direct, a likely V10. The climbing went well, but a couple of things I observed in the vicinity were upsetting. One is the practice of throwing pads downhill to save the trouble of carrying them. I suppose in a truly barren talus field that might be OK but by disturbing soil and vegetation, pad-throwing denudes and erodes the landscape. Pad-throwing is lazy and very harmful to the environment. Secondly, please don't bring your dogs bouldering. The Dark Side is relatively green with trees and low-level vegetation. Amusing your dog by throwing sticks down the hill to chase means that dogs will bound through all that growth, tearing it up and killing it. 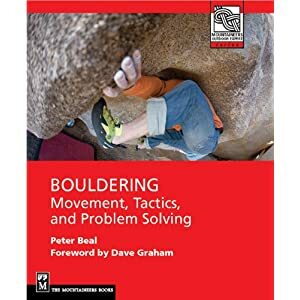 My recommendation now is that for virtually any popular bouldering area near Boulder, your dog should be left at home. If you must bring a dog, respect the environment and keep the dog leashed unless he/she is truly well trained. Finally, please don't bring glass bottles to Flagstaff. Glass is prohibited in OSMP anyway and more and more microbrews are coming out in cans which are much easier to pack out and less dangerous if inadvertently left in the field. I plan on a fuller post on the topic of environmentally sound bouldering very soon. Good call on the pad tossing and dogs. I don't know about Flag, as it is so well trammeled, but I think what you said is particularly important for other areas that have sensitive access issues. It continually disheartens me to see pros, semi-pros, and reps from the Front Range with their dogs in areas that are specifically off limits to dogs. If these are the people who are pushing and repping the industry, I would hope they could at least portray us in a favorable light. If not to other climbers, at least to the OSMP and other agencies.